Nearing our night shift yesterday morning, I got up from where I was sitting to help my co-worker who was assigned to see an inmate being wheeled by a deputy on a guerney. This inmate was complaining of “severe dizziness”. His medical history recorded how he just came back from the hospital couple of days ago, treated for ingesting an illegal substance and for dehydration. The balls of his eyes were constantly rolling upward as he laid his head against the thick wall. As I approached the other nurse, she looked unsure of what next step to do. “May I help you with anything?,” I asked her. “Check this out Rcubes. What do you think? He’s so dizzy but all his vital signs are normal. His blood pressure is a normal high,” she answered. Hearing that the vital signs were normal, especially the blood pressure, without any other known medical conditions, I already had a gut feeling that this inmate was faking. When dehydrated, blood pressure usually dips down as some of them don’t drink enough water in the prison. “Nurse Rcubes, this is legit!” commented the deputy. “Hmmm…I wouldn’t say that yet,” I replied as I made some head movement suggesting he was not sick. He looked at me baffled why I didn’t believe him when he saw everything when he went down on the floor as he tried to walk in his unit. “Have you tried doing a postural blood pressure readings?” I suggested to the other nurse. “You’re right! Now, we’ll know for sure!” she exclaimed as the male inmate slightly opened his eyes and wondered what I meant for that kind of test. He started rolling his eyes again. There was no nausea nor vomiting. We told him to get up. Leaning upon the walls, he walked in a slanted position and down he fell on the floor, his head almost hitting a big trash bin, but he immediately avoided it. The 2 deputies immediately ran to help him get up. I just smiled and didn’t say anything. I knew the other nurse saw me and felt why I just smiled and didn’t seem concerned a bit. The deputy still looked at me and wondered why I wasn’t doing anything to help this inmate. And the deputy looked at me and finally got it that I was right about this inmate faking the whole thing. He wasn’t dizzy. He wanted to go to the hospital so he could be given something for his drug seeking habits. I have learned from this life’s journey that some things in the past will not help me to keep pressing on, the future I’m completely unaware of what’s to occur. But He does. 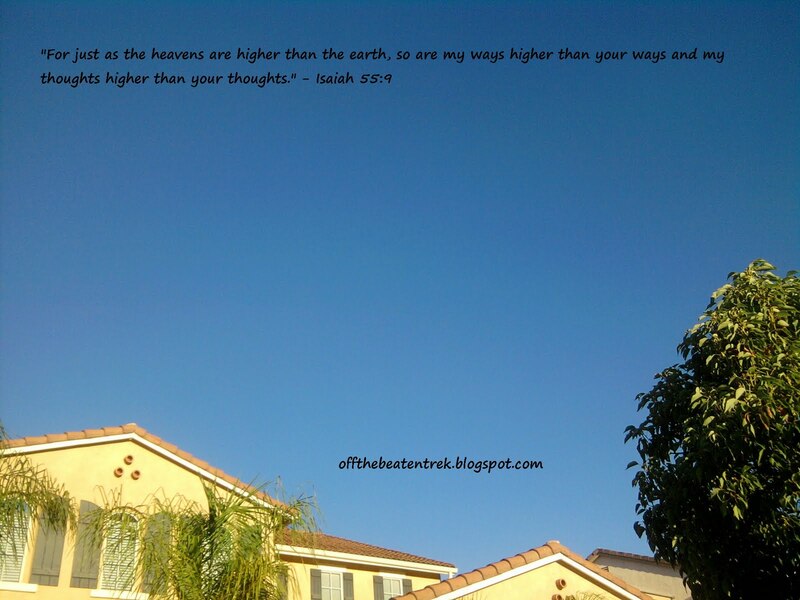 I have no option but to look up and know that His ways and thoughts are truly higher than ours. What this world says, I don’t believe because the enemies are making sure to try everything to thwart God’s purpose in my life. But thanks be to God, I [we] have His mighty power and might, His armor to wear to guard me against all evil ways.